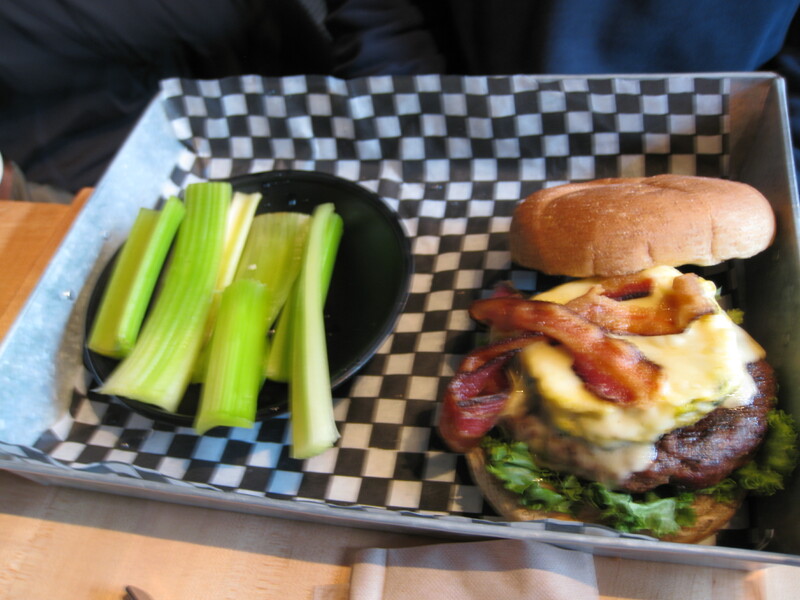 A group of friends and I went to The Works in early April for lunch. 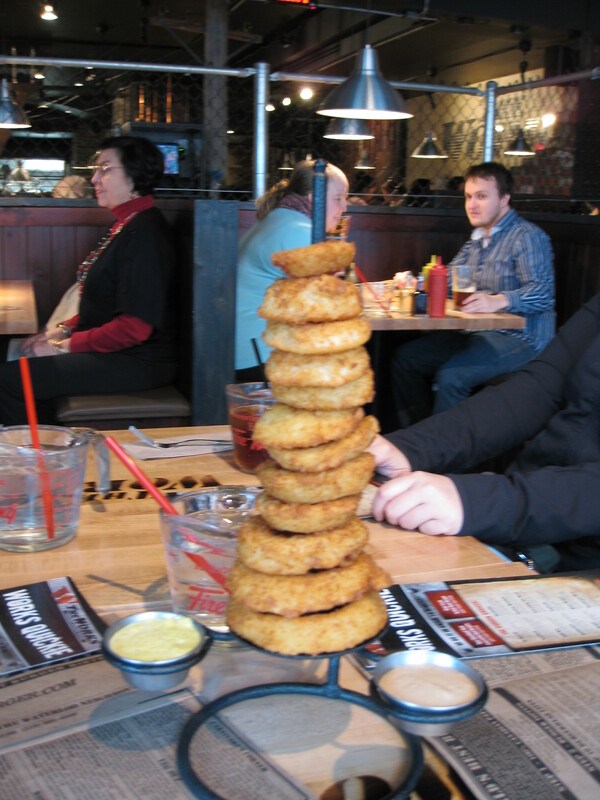 Afew of my friends had previously been there before so we were able to get 2 free Tower of Rings since my friends kept their previous receipts and filled out the online survey. There were 8 of us in total. Aside from two of my friends, we all ordered different burgers. I modified the Uptown burger so it has ground turkey patty, feta cheese, avacado, grilled eggplant, pesto and lettuce on a whole wheat bun. I ordered the sweet potato fries as my side. 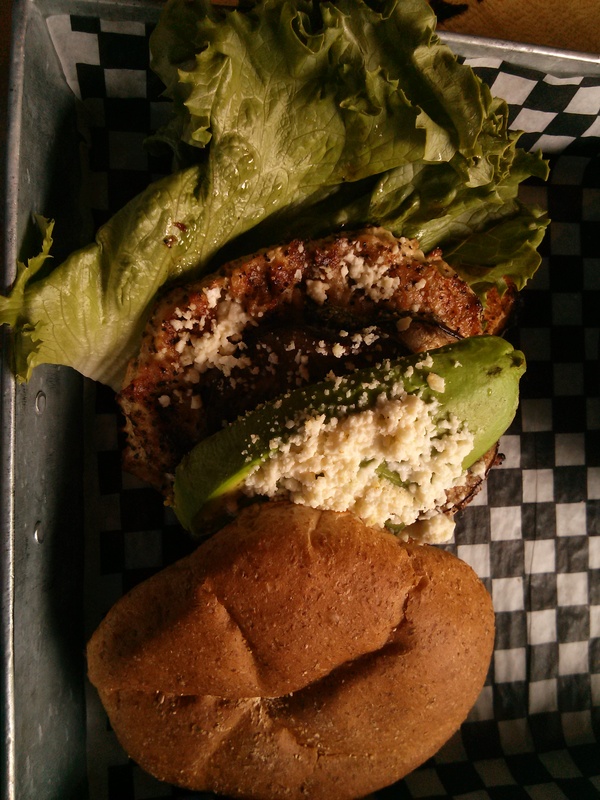 The original Uptown burger has feta cheese, avacado, grilled eggplant, salsa loco and lettuce. The waiter said that there would be no extra charge for the substitution. 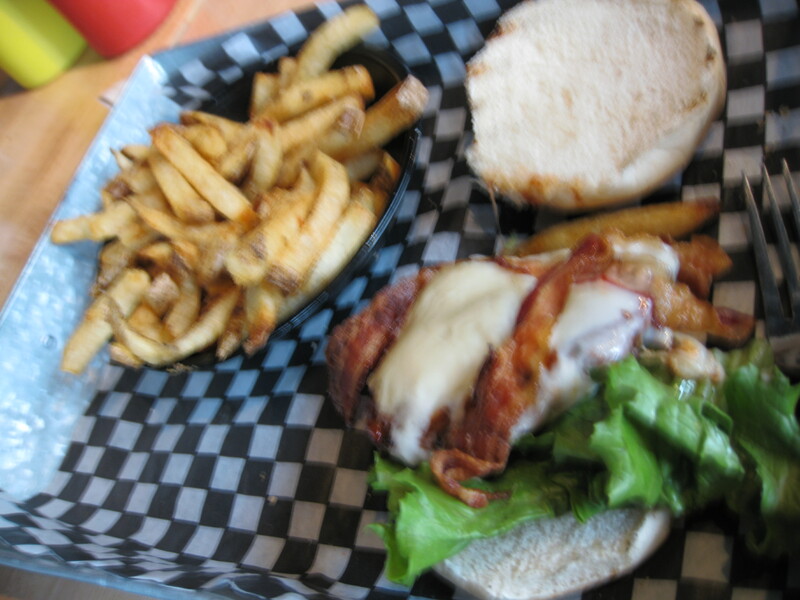 I liked my modified Uptown burger. It was the perfect blend of feta cheese, avacado, grilled eggplant, pesto, lettuce, turkey and bun for every mouthful. 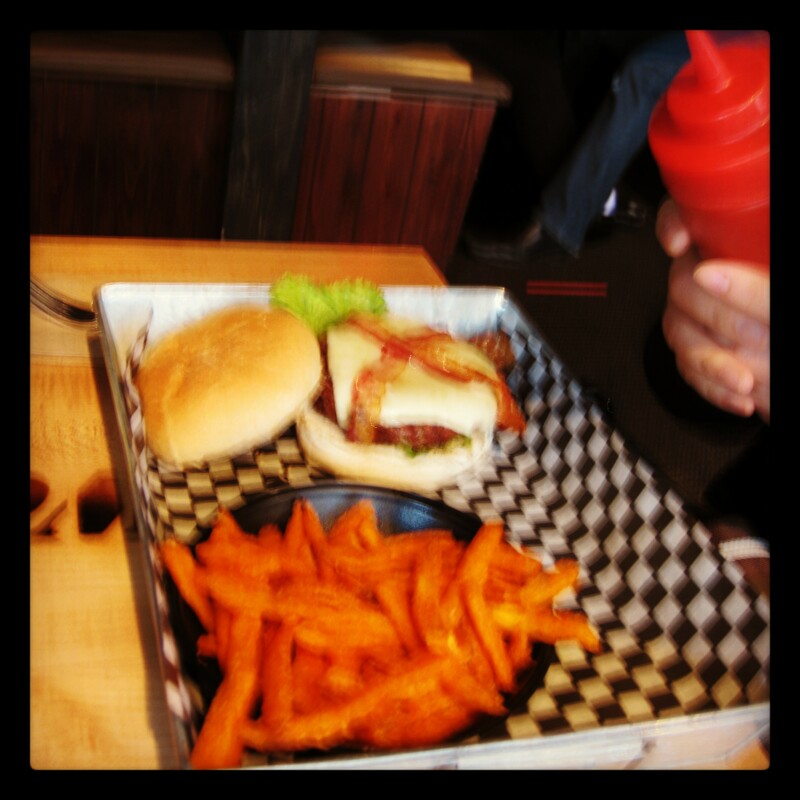 The sweet potato fries were also delicious. 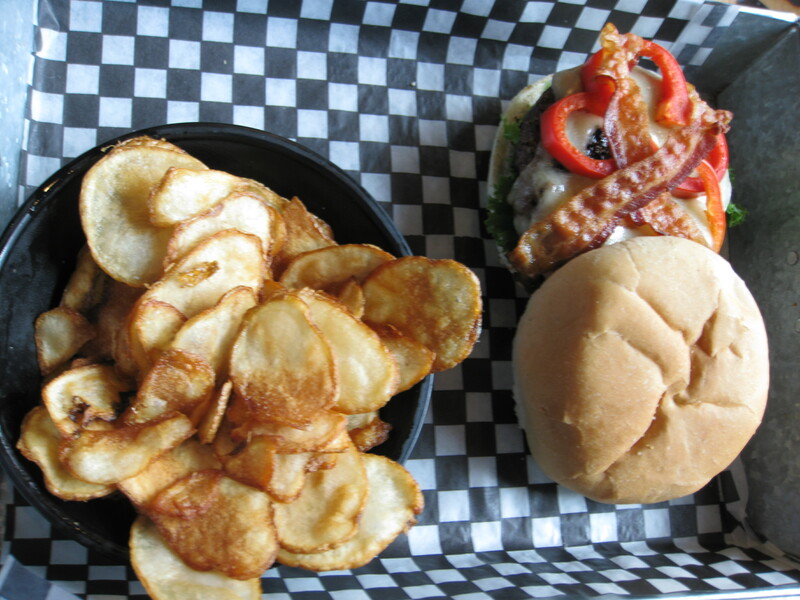 If you want to be able to customize your burger, this restaurant is the place for you! My friend and I attempted to go to this restaurant for dinner on a Tuesday in early May however the restaurant was closed for dance lessons causing us to go to Nara Sushi for dinner instead. 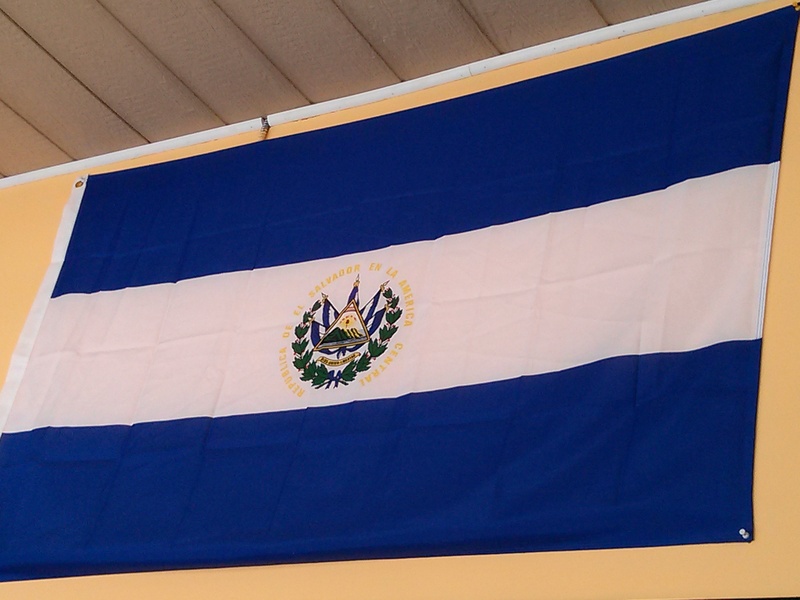 I was able to go yesterday to the restaurant and treat myself to Salvadorean cuisine. The restaurant is on the second floor of the building so you have to walk up a flight of stairs to get there. 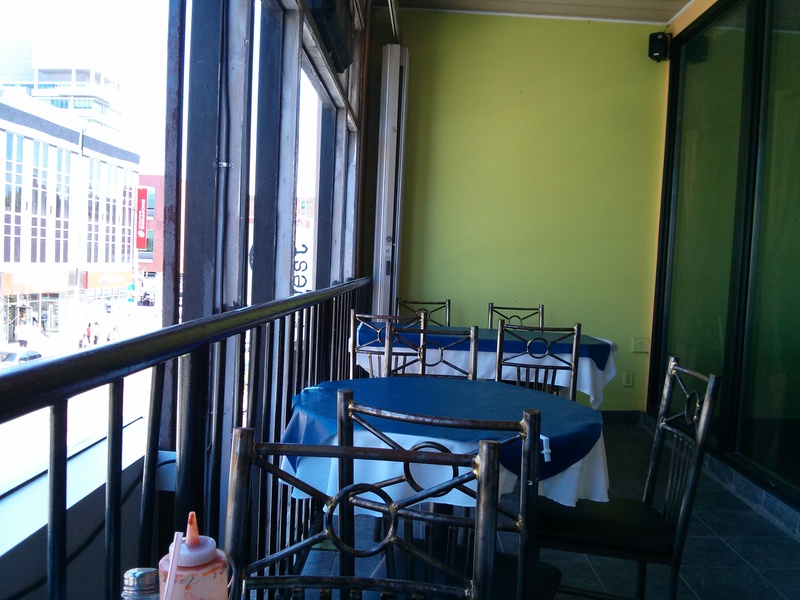 It has outdoor seating on the balcony patio and indoor seating (several booths and many tables). I chose to dine al-fresco. I ordered the Guanaquita Platter (1 pupusa, 1 pastelitos, 1 enchilada and 1 tamales) ($9.95) and horchata (rice milk drink) ($2.25). Unfortunately I went at the wrong time and they didn’t have tamales so I replaced the tamales with another pupusa so my Guanaquita Platter consisted of 1 pork and cheese pupusa, 1 bean and cheese pupusa, 1 pastelitos (Salvadorean patty), 1 chicken enchilada, spicy salsa and coleslaw. I preferred the pork and cheese pupusa over the bean and cheese pupusa. 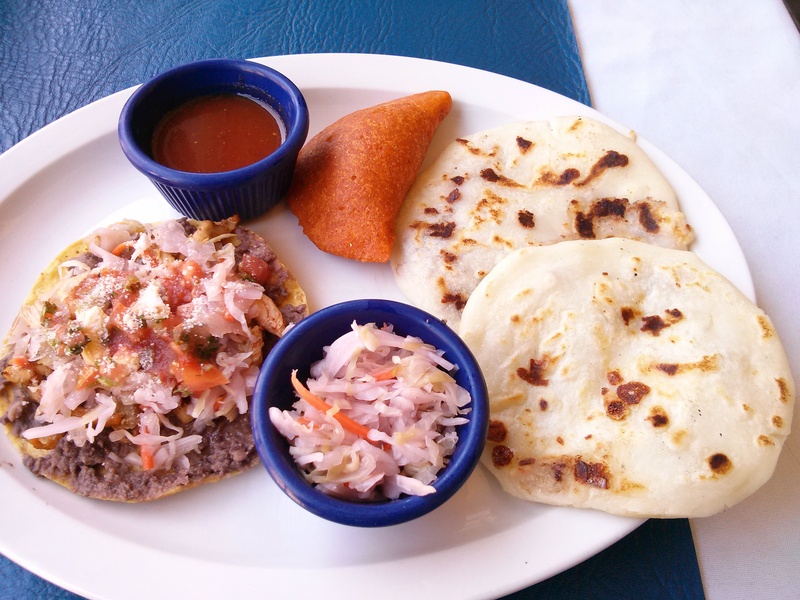 You could barely taste the bean in the pupusa since it’s basically mashed up and the cheese overwhelms the taste of the beans whereas with the pork and cheese pupusa, you can easily taste both the pork and the cheese. I really liked the pastelitos. 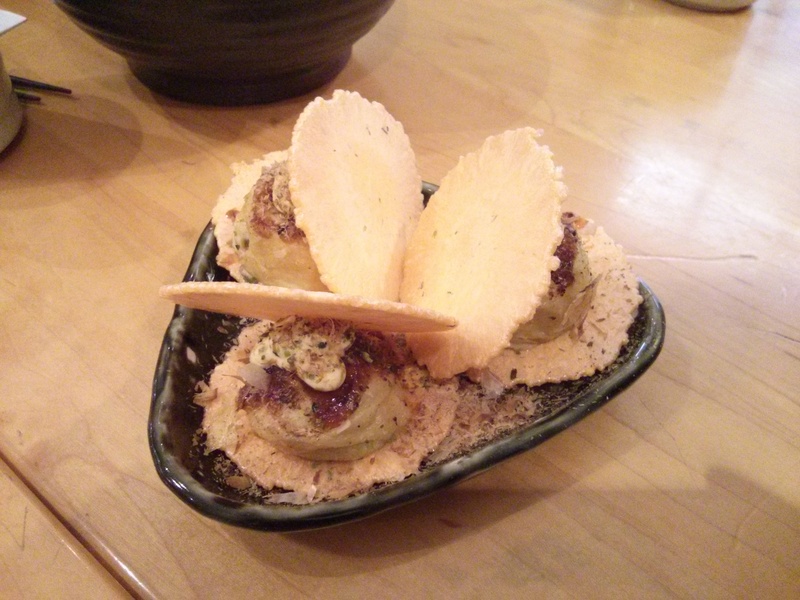 It has a vegetable filling and it has a crispy taste to it. It reminded me of a Jamaican beef patty but instead of a beef filling it’s a vegetable filling. The chicken enchilada was nice. 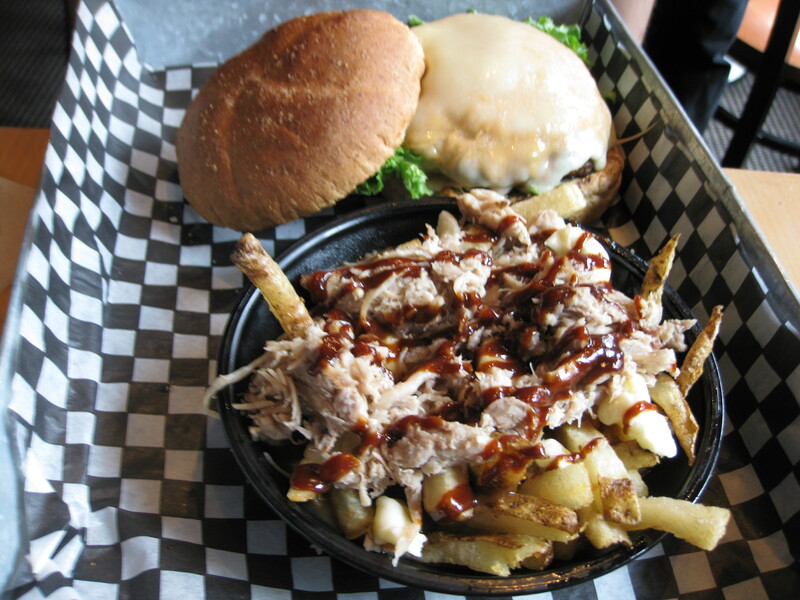 It’s a bit messy to eat but it was tasty. The spicy salsa was only spicy for the first 3 minutes, afterwards it wasn’t spicy. Guanaquita Restaurant also provides salsa hot sauce and it’s definitely hot! The coleslaw was a nice touch to the meal. 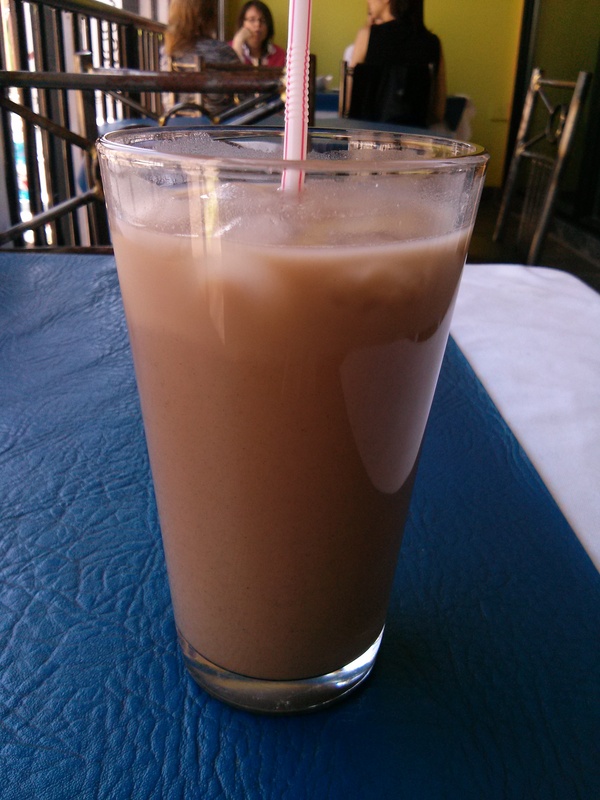 I recommend ordering the horchata. It’s milk with a sweet cinnamony, black sesame taste to it. It’s a cold drink since it has ice in it. 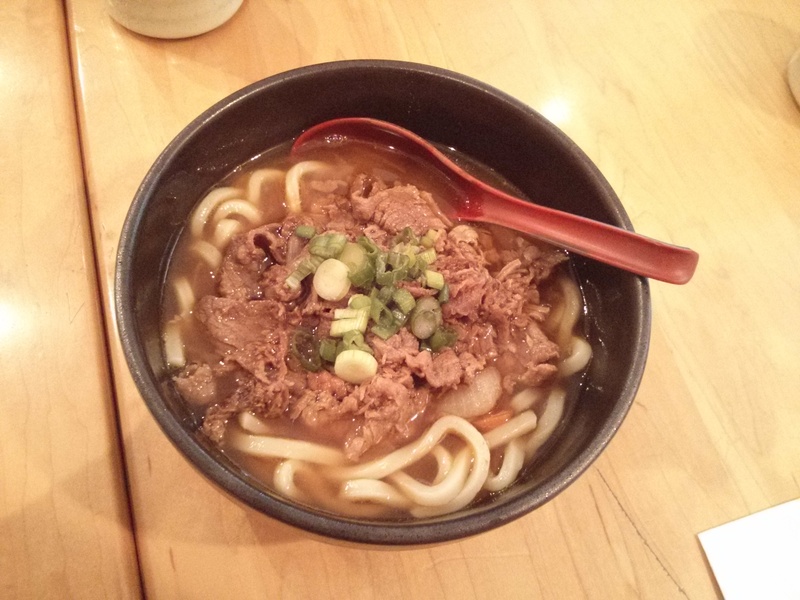 It’s very delicious and worth the price. 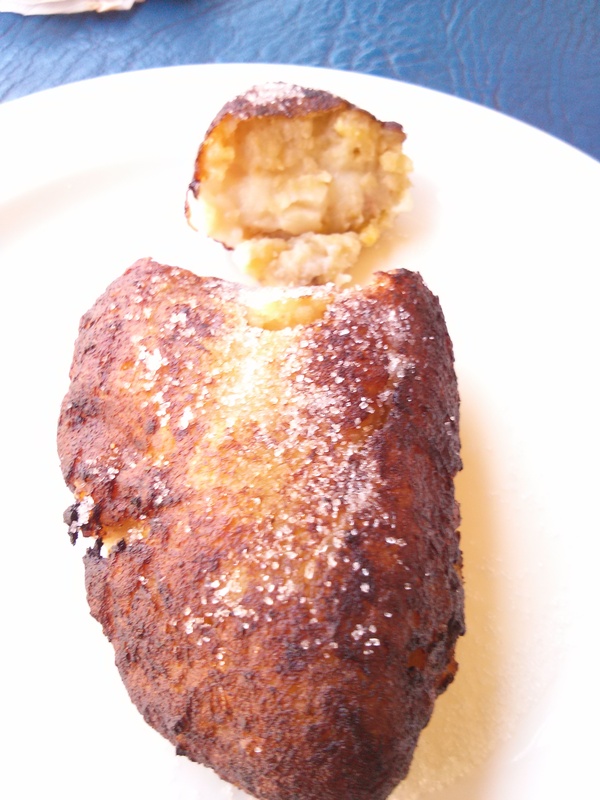 I also ordered a plantain patty filled with milk ($2). It was alright. The milk wasn’t as smooth as I would like it. Overall, if you want to eat South American cuisine, in particular Salvadorean cuisine in Kitchener-Waterloo, for less than $20 per person then this is a good restaurant to go to. My friend from Singapore and I wanted to try a different cuisine that wasn’t Asian or Western. This restaurant was recommended to me by my friend’s friend. 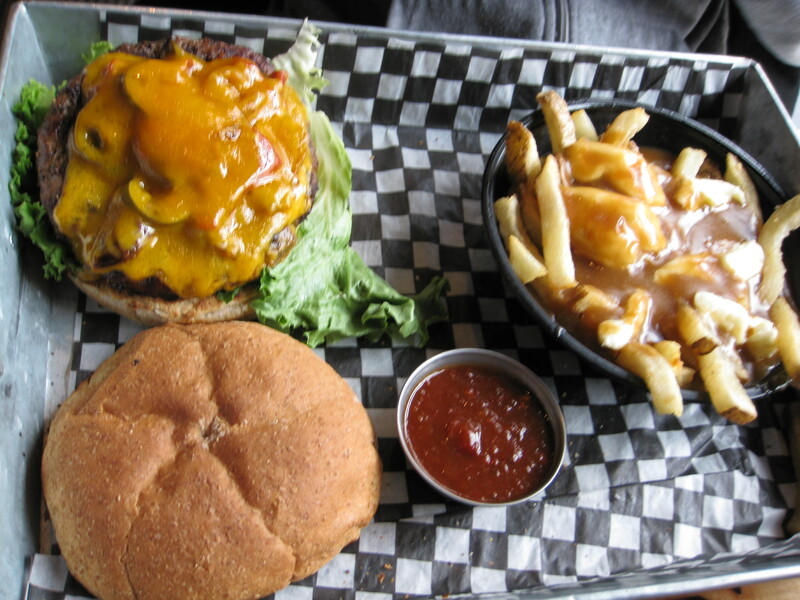 It’s a charming restaurant and the servers were very friendly and welcoming. 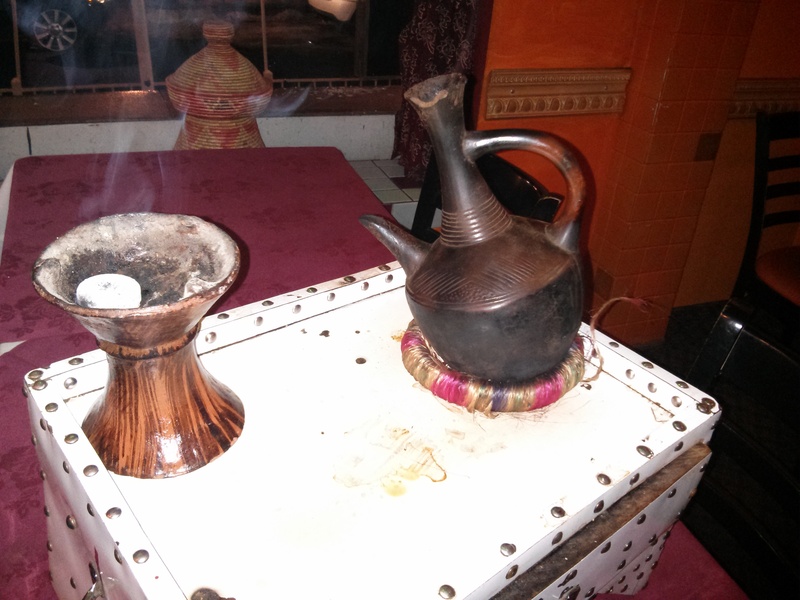 We had the Ethiopian coffee (~$20), Bayaaynatu ($14.95) and Vegetarian Bayaaynatu ($13.95). 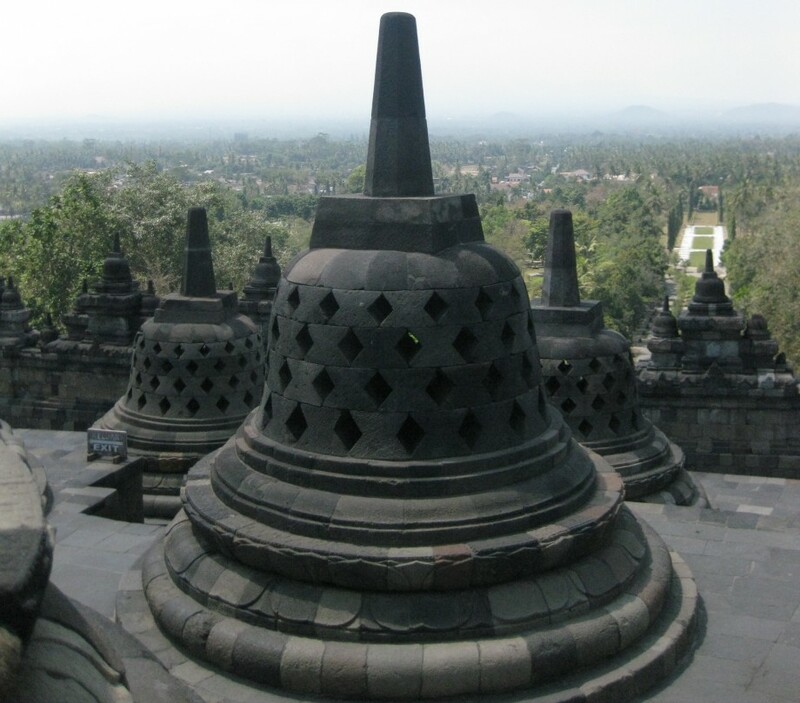 Vegetarian Bayaaynatu comprises of Misir Wot, Sherro Wot, Tikil Goman, Goman Wot, Yekik Alicha, Kik Wot, Misir Alicha, and Atakelt Wot. Misir Wot is lentil stew in berbere sauce. Berbere is a dry pepper powder. Sherro Wot is highly-seasoned chick peas in berbere sauce. Tikil Goman is cabbage, carrots, and potatoes that is cooked in turmeric sauce. Goman Wot is kale or collard greens in mild sauce. Yekik Alicha is yellow split peas in mild turmeric sauce. Kik Wot is split peas stew in berbere sauce. Misir Alicha is split lentil stew in thick mild sauce with seasoning. Atakelt Wot is string beans, carrots, and potatoes that is cooked in tomato sauce. Bayaaynatu comprises of Tibs, Kitfo Special, Goman and aib. Tibs is pan fried beef sauteed with onions, garlic, green peppers, tomatoes and awaze with injera. Awaze is a paste made from small hot red peppers, cardamon, and cloves or afrinji made from red pepper. Injera is a type of flatbread. Kitfo Special is steak tarter sautéed with warm keebe and a dash of hot pepper sauce. Keebe is Ethiopian butter which is clarified. During the process, chopped ginger, garlic and onions are added along with other spices, including fenugreek, white cumin, basil, cardamon, oregano and turmeric. Goman is collard greens. Aib is cottage cheese. 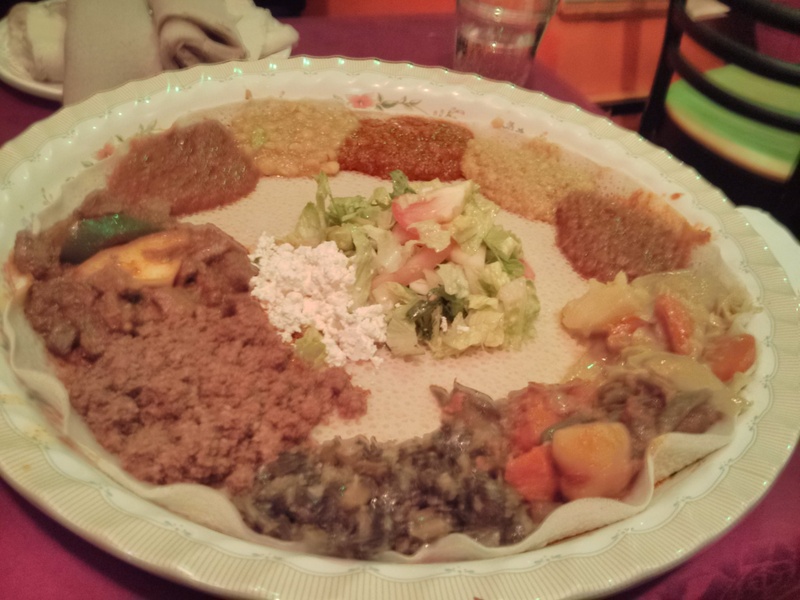 Our server combined Vegetarian Bayaaynatu and Bayaaynatu onto one large serving platter with injera just on top of the platter, as you can see with the above picture. We also had a side dish of injera. 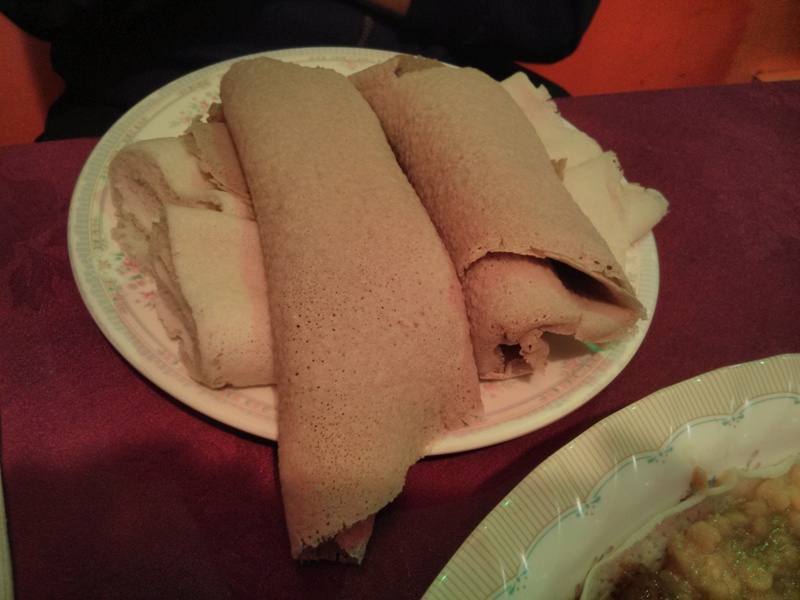 Injera is like roti/chapatti, dosa, paratha, and/or naan in that they are all flatbreads however injera is more sponge-like and is much softer and not as course as Indian flatbread. It is also not as crunchy as Indian flatbread. The way you eat Ethiopean food is similar to the way you would eat Indian food. There are no utensils so you would first wash and/or sanitize your hands. You would rip a piece of injera into a small piece and use that to pick up the sauce/food and you would eat it. My friend and I both enjoyed the Vegetarian Bayaaynatu and Bayaaynatu. My friend found it quite similar to Indian food. It’s definitely not as spicy as Indian food. I found it to be a mixture of Middle Eastern and Indian cuisine with its own unique flair and taste. Ethiopean coffee was an interesting experience. It’s made in front of you and it smells quite nice. We only had one cup of Ethiopian coffee each. It comes with a large bowl of unbuttered popcorn. I would have like to have more than a small cup of coffee however it is quite strong. 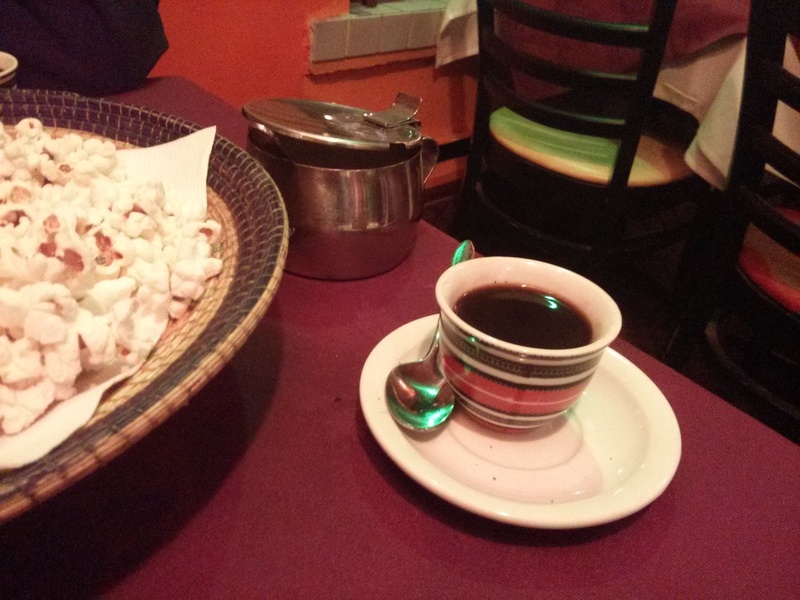 Overall, if you haven’t had Ethiopian cuisine before, this restaurant is a good introduction. My friend and I had dinner at Tofu Village prior to going to Comedy Bar last Saturday. My friend arrived earlier than I did so he ordered an appetizer first. He got fried dumplings ($6.95). I tried one and it was alright. I ordered the House Special Soon Tofu ($7.45). I ordered it as medium spicy. The House Special Soon Tofu comes with rice in a stone pot, 1 raw egg that you crack into the soon tofu, tofu, beef, clams and 1 shrimp. It was delicious and filling. The portions were generous and I ended up having leftovers to take home for dinner on another day. 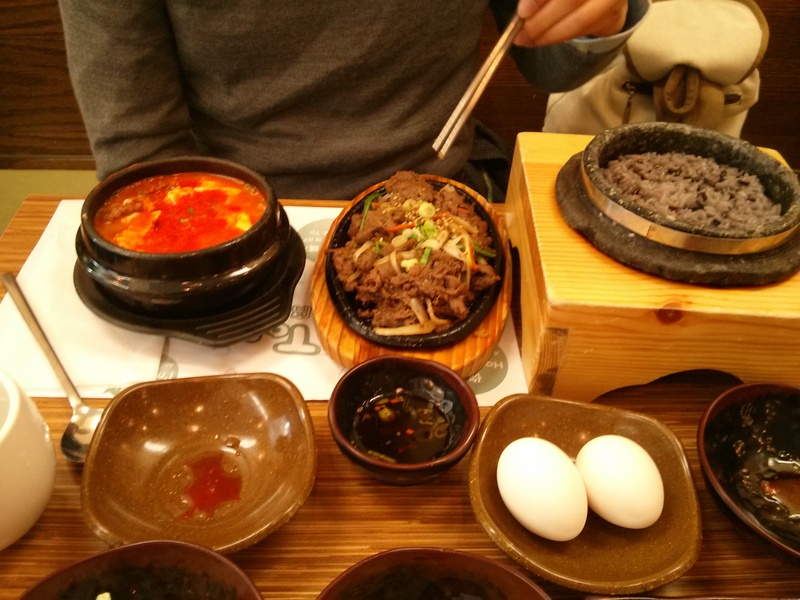 My friend got the soon tofu and bulgogi combo ($13.95). The soon tofu is the house special soon tofu but in a much smaller bowl than mine and bulgogi is Korean BBQ beef. It also comes with rice in a stone pot. My friend liked it. 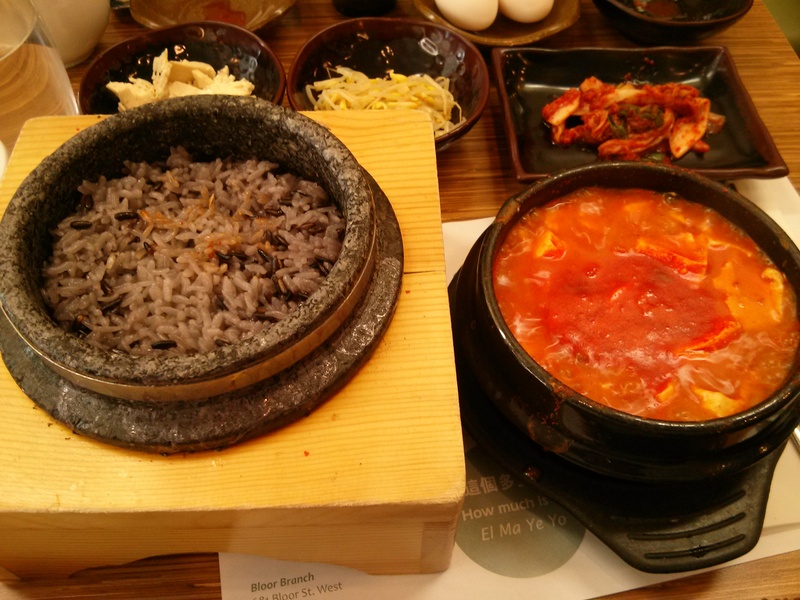 No Korean restaurant experience would be complete without kimchi and other side dishes. 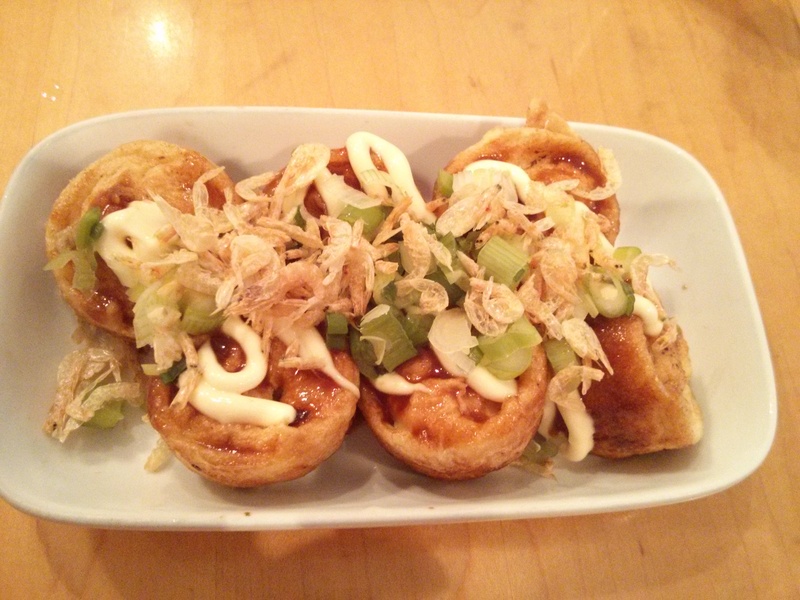 Tofu Village has 4 side dishes. I liked the fried tofu side dish best (bottom right in the picture below). 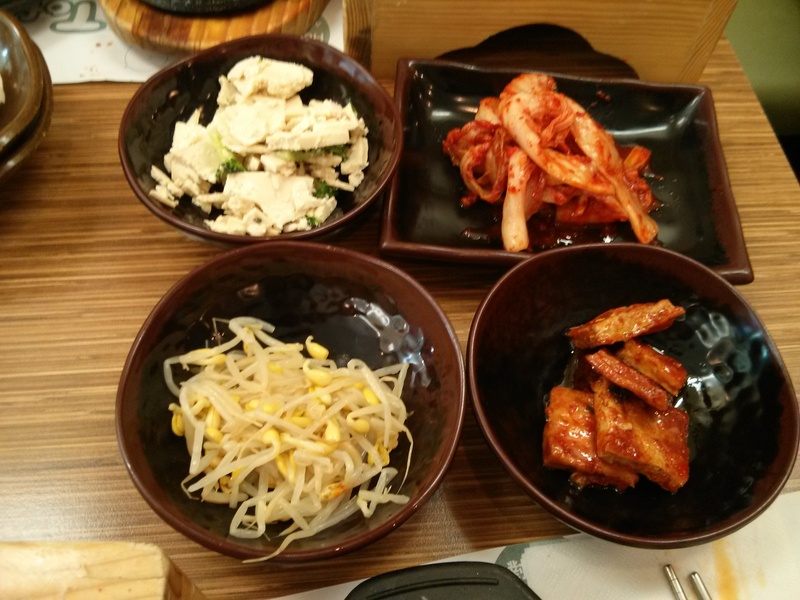 The kimchi and beansprout side dish (top right and bottom left, respectively, in the picture below) were good however the other tofu side dish was very salty (top left in the picture below). Overall, if I was in Koreatown and I was craving soon tofu, I would recommend this restaurant.